A simple machine�and with it for everybody who wants a device to take along a saddlebag, a friction brake and two stands to be able to park the machine on free places. Such a running machine made to measure procured by Drais isn't extant. A same one with a device to screw the seat higher or lower. same time with the raising device for the seats. Such a tandem is not extant. A three-wheeled or four-wheeled machine that has a usual seat between the two front wheels and a riding seat behind with the device to either raise or lower it. 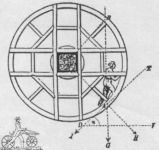 three-wheeled runningmachine © Prof. Dr. H. E. LessingSuch machines are extant at the Fuerstenberg collections in Donaueschingen - a girl in trousers astride a saddle (as on the photo) was unthinkable though at those times! Her place was in the front seat. The first good harvest after five years, long waited for, occurs in the autumn of 1817. The price of oats goes down, and horses are bred again. 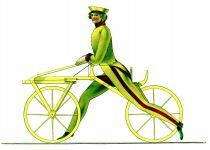 Only now the draisine riders make a bad impression by using the plane sidewalks instead of the rutted carriageway where their machines cannot be balanced. Bans with hefty fines choke off draisine riding for half a century. The two-wheelers ended therefore not by being useless, but by being prohibited worldwide - in Mannheim, England, Italy, USA and even Calcutta.